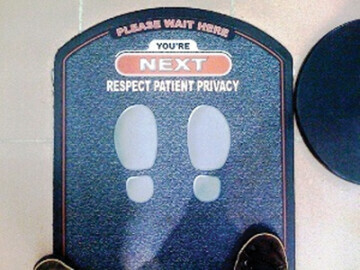 On a recent afternoon, I was waiting in line at the pharmacy to pick up a prescription, standing behind the canvas rope at the placard on the floor that tells you where to wait to ensure the privacy of other customers ahead of you. I always want to stand directly on those footprints but I never do. In front of me at the counter, being helped by a pharmacy technician, were two Asian men, one in his 30’s and the other maybe a decade older. They wore colorful dress shirts with khaki shorts and carried messenger bags. In this small town, which houses the only airport in the area and is one of the last stops for provisions before Yellowstone National Park, these gentlemen were notably tourists. As the cashier was tallying up their purchases, the younger man called out “Wait, wait!” as the older guy darted away from the register to grab two rather large boxes of condoms. ‘Interesting choice while on vacation’ I thought to myself. As the male cashier took the boxes he asked “Two more, huh?”. When he slid them into the partially translucent white paper bag, I could see it already held three such boxes of Trojans. The younger man appeared to be the only one of the two who was speaking English. He listened to his companion briefly and then before the second box was tucked away, he asked “Are these all one size?” The cashier turned the box every which way, closely examining the small print on each side and declared that they were in fact all the same size. That seemed to be acceptable to the older guy. Once the purchase was complete, the cashier asked the men if they were headed to the larger town a few miles away and if they were driving. They said yes, but they were with a tour group so they had no need for the coupon for gasoline that came with their receipt. I watched the entire interaction from my spot at the line marker, obviously that distance is not quite enough to provide the privacy it is intending, and I tried to imagine all the possible scenarios for which these two gentlemen from out of town would need approximately 120 condoms. Are they hoping to get extremely lucky on this vacation? Maybe they’re lovers on a rare getaway together? Maybe they don’t have easy access to prophylactics in their country of origin? Or perhaps they are leaders of the tour group simply thinking ahead and trying to provide their fellow group members with protection? When it was finally my turn to approach the counter for my medication, I gave the cashier a smile but he was as expressionless as a brick wall. Then I realized I shouldn’t have been surprised by his stoicism. I would guess that selling large quantities of condoms to tourists is far from the strangest task his job requires of him. This got me thinking about my role as a veterinary technician. I’ve always been proud of my ability to remain calm and professional when dealing with emergencies and oddities. I once had a client casually tell me that she examines her own stools each day. I’ve had owners confess to me that their ill pet has recently ingested pot or used condoms or thong underwear, and I’m always able to maintain a straight yet friendly face while I assure them that we will be able to treat their beloved pet properly. Years ago in an exam room, I asked a female client why she had brought her beagle in to be seen and she stated matter of factly “She has a filthy p@#&y.” I didn’t even pause before I replied, “Alrighty then, let’s see what we can do about that.” It was clear to me that these were simply the only words she had to describe her observations. Working with the public can be challenging at times. Clients often expect their current problem to take priority over the other things I’m dealing with and that’s not always appropriate. I often have to do a lot of assessing in a short amount of time in order to respond properly. But my work can be incredibly rewarding. There’s no feeling that compares to helping save a family’s pet or providing a grieving owner with solace during euthanasia. My job can be fun, difficult, dirty, heartbreaking and it challenges me physically and emotionally; usually all in the same day. When I took a brief break from working in the veterinary field, I realized there is literally nothing else I would rather do as a job. I don’t know how that pharmacy clerk feels about his job but I’m guessing there are rewarding parts to helping provide people with their medications as well as frustrating parts. I’ve found that to be true of all the jobs I’ve ever had. Those tourists were fortunate to have someone help them who took the task seriously, even as I observed in disbelief. I guess this all just proves my personal philosophy that everyone is good at something, has a purpose, and we’re all in a certain place at a certain time for a specific reason. What was probably a simple interaction to all parties involved was incredibly interesting to me and gave me a lot to think about. This is why I enjoy writing non-fiction and why I carry a notebook everywhere I go. There’s always amazing things happening around us, sometimes funny things or examples of kindness or just something spectacular; a week later I pulled up to the same grocery store and saw a man getting arrested for fighting in the parking lot! It’s a reminder to keep my eyes open all the time, to focus on the moment I’m in, instead of worrying about what I’m doing next.